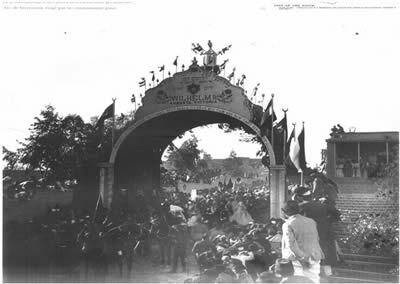 In 1898 Kaiser Wilhelm II (1859-1941) made a triumphal entry into Jerusalem as multitudes gathered at Jaffa Gate to welcome the Prussian King and German monarch. The visitor left his mark on Jerusalem. Amongst other things he donated a large sum of money which was used by Bikur Holim Hospital to purchase the grounds where the current medical centre stands on Rechov Strauss. Despite Wilhelm's support of the hospital he periodically was quoted in rabid anti-Semitic outbursts, for example calling Jews "parasites" holding "nefarious positions." During the royal visit to Jerusalem, Wilhelm also laid the cornerstone for the later construction of Augusta Victoria (named after his wife), a complex on Mt. Scopus that would later become a church, hospice and hospital. Until the late 1920s Augusta Victoria also served as the residence of the British High Commissioner for Palestine until he moved to Armon HaNatziv. The Kaiser's six day visit to Jerusalem was royal in every sense of the word. "Tent City" was erected on today's Rechov Ha-Nevi'im. No, the tents were not standard army issue. Four grandiose parlor tents were specially sent by the Ottoman Sultan, who sought to align himself politically with Germany. There were also six kitchen tents to prepare food for the two hundred person entourage. 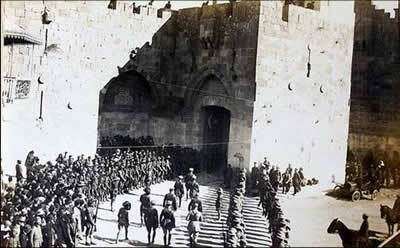 Wilhelm II left an indelible stamp on Jerusalem. He dedicated buildings, and streets were paved in his honor. History, however, has not treated him kindly. There are those who contend that his political machinations were inept and a major cause of World War I. Others argue that the Kaiser had every intention of going to war, and merely waited for what he considered the most appropriate opportunity. In any event, his army lost the war, and he was forced to abdicate. Wilhelm fled Germany and took refuge in the Netherlands, where he was granted asylum from calls that he be tried for war crimes by an international tribunal. The Kaiser demonstrated staunch opposition to the Nazi Party, not for any concern for Jews, but as indicative of his dedication to Germany --- ruled by his family, of course. (At one point he promoted ascendancy to the throne by one of his grandchildren, but the move gained no real public support.) When a son later expressed Nazi sympathies, he was quietly declared an outcast by the family. Wilhelm used the Nazis, and the Nazis used Wilhelm. The deposed Kaiser voiced opposition to Hitler's movement, yet he received Göring in his Dutch residence. Hitler knew well of Wilhelm's opposition to Nazi rule, but accorded him a ceremonial funeral (in which no swastikas were displayed). One very correct observation has been made about the two dictators --- Wilhelm II and Hitler. Adolph Hitler grew up in the Germany of Wilhelm II. Dictatorship and one man rule were the spirit of the day, and anti-Semitism was an acceptable norm. As history, however, has sadly shown, Hitler went far beyond the levels of his national mentor. Now, 110 years after the historic visit, another member of the Hohenzollern Family has come to Jerusalem and was welcomed at Jaffa Gate. 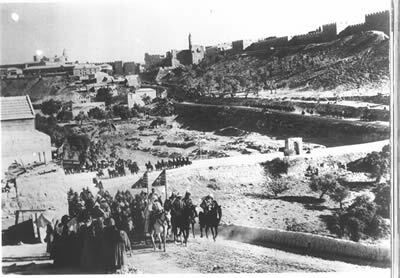 The Kaiser's great-great-grandson, a 32 year old bachelor and graduate of a British university holding officer's rank in the German army, traveled from a ceremonious welcome at Jaffa Gate to Bikur Holim Hospital to see the hospital in whose history his ancestor played a key role. 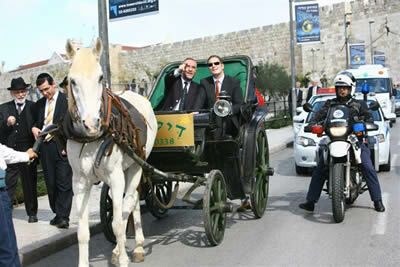 This is part of Bikur Holim's effort to fortify a century-old connection.